On Saturday afternoon Chris and I ventured to our local Target to pick up the new book by Stephenie Meyer: The Short Second Life of Bree Tanner. I had it marked on my calendar that June 5th was the day, and I even looked at the Target Weekly Ad the previous Sunday to make sure they'd have it. So imagine my surprise when we went to the book section and there was no sign whatsoever that such a book existed. No signs, no raincheck stubs, no nuttin'... I walked over to the nearest employee and asked her if they had the new Stephenie Meyer book and she said, "I dunno, but this guy will." So I waited for this employee to finish up his transaction and then I asked him, "Do you have the new Stephenie Meyer book, you know, she wrote the Twilight series?" "Oh yeah! Twilight. Aisle D13." So we walked over there, knowing full well we wouldn't find anything except the already existing Twilight books. We had already looked over there, duh. At this point I felt like shouting: I FEEL LIKE I'M TAKING CRAZY PILLS! I KNOW I'M NOT THE ONLY TWILIGHT FAN IN ALHAMBRA/SOUTH PASADENA! I SAW THE MOVIE THEATERS WHEN NEW MOON CAME OUT! THEY WERE PACKED! WHERE ARE THE STACKS OF BOOKS? THE CRAZY FANS? THE SIGNS? THE TWILIGHT PARAPHERNALIA?!?! After an unsuccessful attempt at Guest Services to locate my book, we gave up and went to Costco. 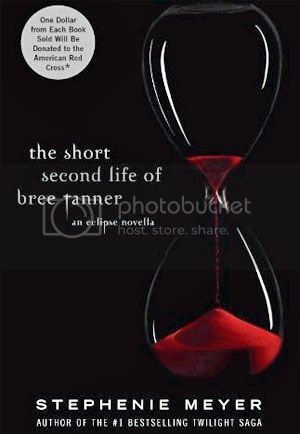 There they had a mini stack of the Bree Tanner books and I finally snatched my own copy. Still, I was surprised there weren't pallets of the book and tweeny girls hoarding around 'em. I guess it's not such a big deal here? i totally forgot all about that! I really want to read eclipse again too before seeing the movie. It was my favorite book and I am sadly starting forget things. Let us know what you think of the book! by the way, your belly is just getting cuter! There were stacks and stack of it at Fred Meyer in Monroe...I guess we are bigger Twilight fans out here in the sticks! Haha...or maybe its due to the series being set in Washington? I dunno. Or maybe everyone is just taking advantage of being able to read the whole thing on-line for free. This book showed up as a late birthday present to me. I hadn't heard about it at all. If Utah cares I haven't heard. that's funny i havent even heard of this book before. I don't think they really advertised it very well apparently. Wait what is this book about? Who's Bree Tanner?? I saw a ton of them at Walmart yesterday. I am mad... I want Midnight Sun to come out... and I am frustrated this came out before! But, in true Twilight mania, I am sure I will buy it on pay day! I hadn't heard of it either... Humph. So do you like it so far? bought it over here in the Netherlands today. Hadn't heard of it before...Can't wait to get started! Let me know if you like it. Personally, I could care less about "Bree Tanner", but maybe it's good? Let me know.